“What, baguettes again? Didn’t you just do these last month?” Yes indeed, I did baguettes last month. However, these are different! 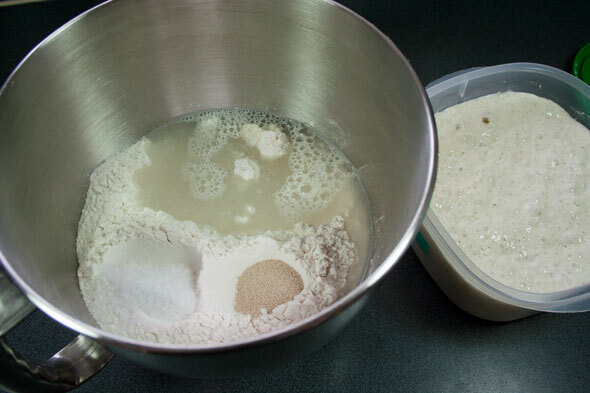 This time around, the dough is made with a poolish pre-ferment (equal parts flour and water plus a tiny smidgen of yeast, left to mature for several hours). 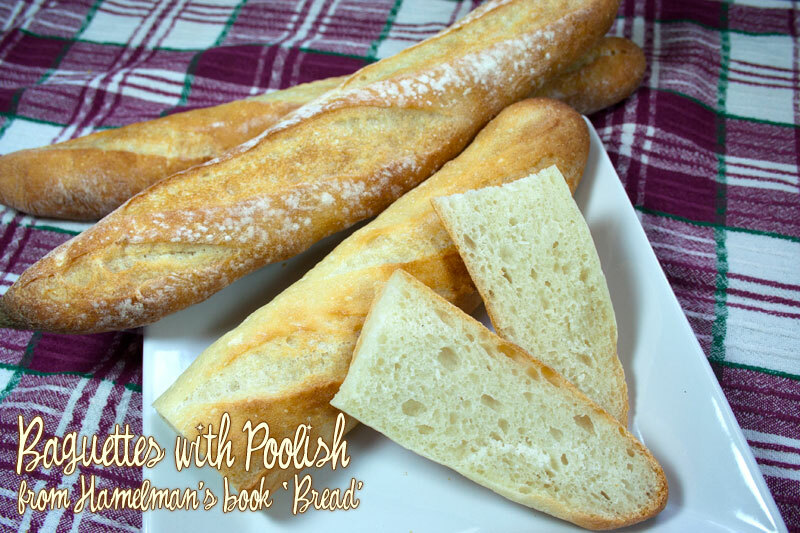 Last month’s French Bread was a straight dough and came together in about 4 hours. So what does the poolish accomplish for us? 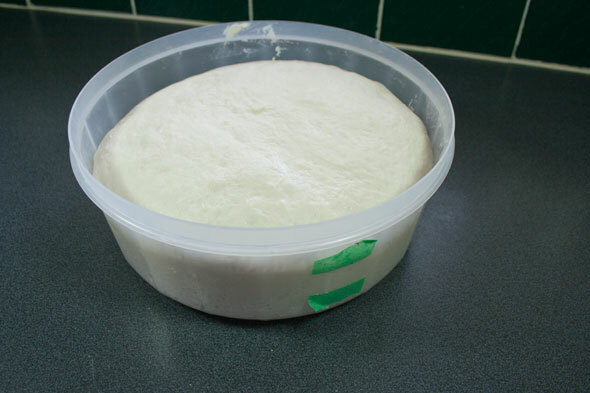 Because it’s allowed to sit for 12 to 16 hours, it’s got time to ferment the flour and in so doing, develops a stronger dough, superior flavour, better keeping quality and actually shortens the time it takes to make the bread, in spite of requiring a long pre-ferment period. 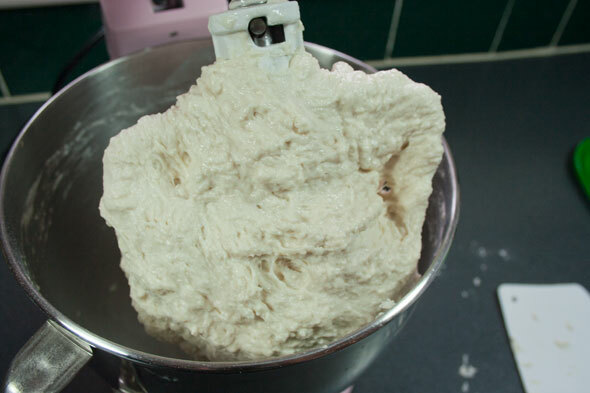 By mixing the pre-ferment ahead of time, taking just a couple of minutes, the action of the enzymes on the dough, when mixed together, speed up the bulk and final proofing considerably. Of all these aspects, the one that will stand out most to those who eat it is the improved flavour. Let’s move ahead then and see if this is indeed the case. 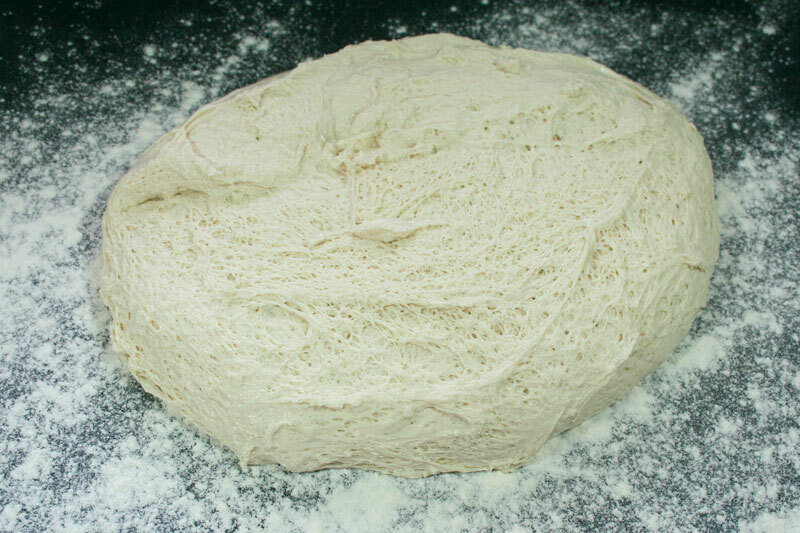 We have bread flour, water, salt & yeast and our now well-developed poolish which is easily twice its original size. Amazing how a teeny amount of yeast can do that. 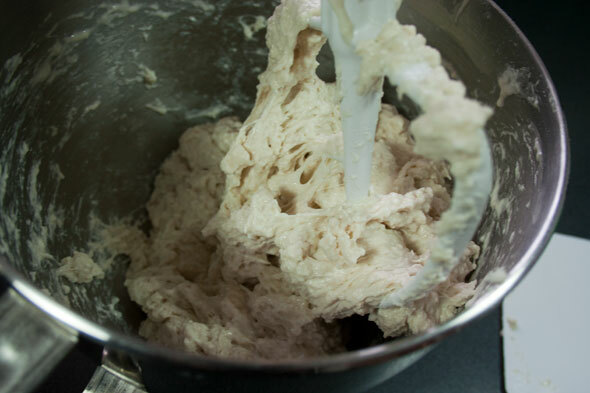 All ingredients go into the bowl, including the well-developed poolish. The mixer then gets started up with the beater for about 3 minutes. 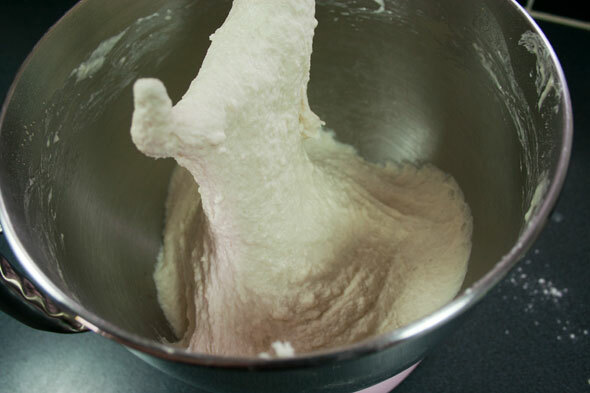 Here we can see very clearly the development of the dough during the mixing time. We’re seeing the dough after one minute, at the end of three minutes with the beater to get everything well incorporated. Next we switch to the dough hook for another 3 or 4 minutes. 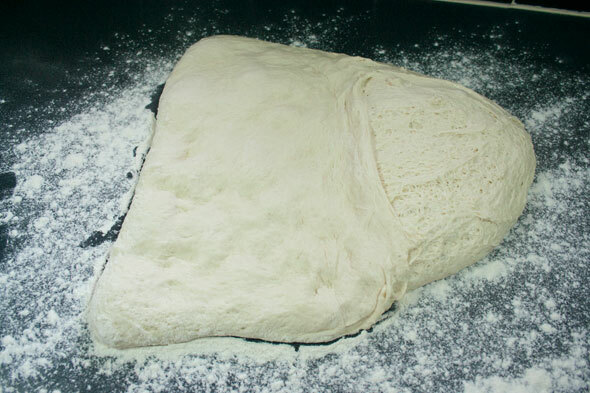 At that point, the dough is fairly well-developed for our needs so it’s now ready to turn out into an oiled bowl for a two-hour bulk proof with one Stretch and Fold at the one hour mark. 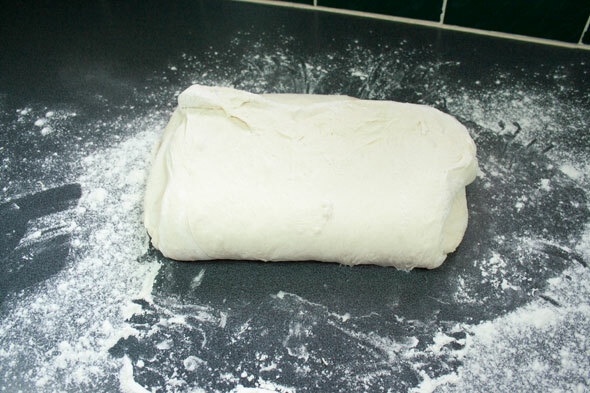 After an hour, the dough is turned out onto the floured countertop. Click to look at that photo and note how well-developed the gluten structure is here. 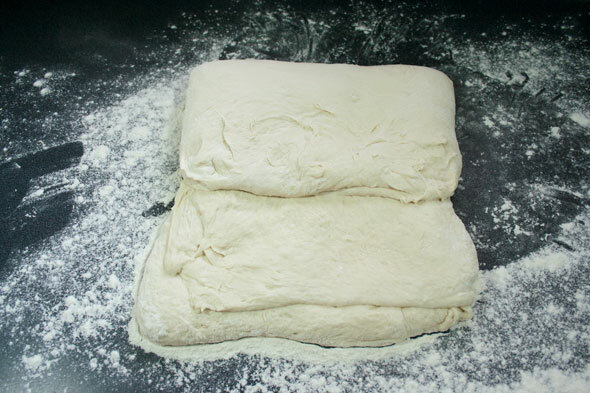 Here the dough gets stretched and folded back onto itself in one third. 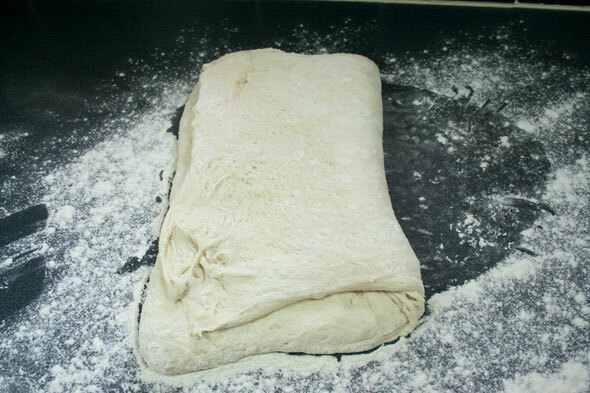 This fold is then gently degassed and any raw flour is brushed away. The same fold, degas and dust away step is repeated for the right, top and bottom side. The folded dough is then turned over so the smooth side is back up, dusted and then the whole thing returned to the bowl for another hour. 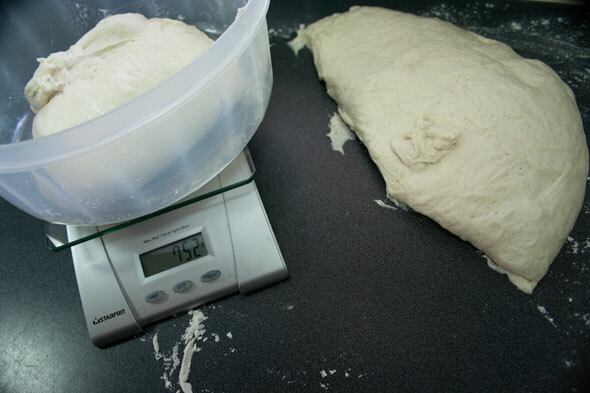 At the two hour mark, the dough has increased in size a fair bit. Now it’s time to divide it. 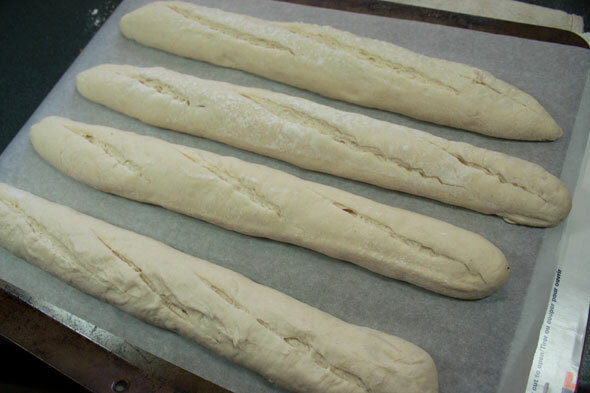 I decided this time around to make a loaf and four mini baguettes so I split the whole dough in two. I had 1498 grams total. One half was formed and placed into the cane banneton, covered to keep it from drying and set aside. 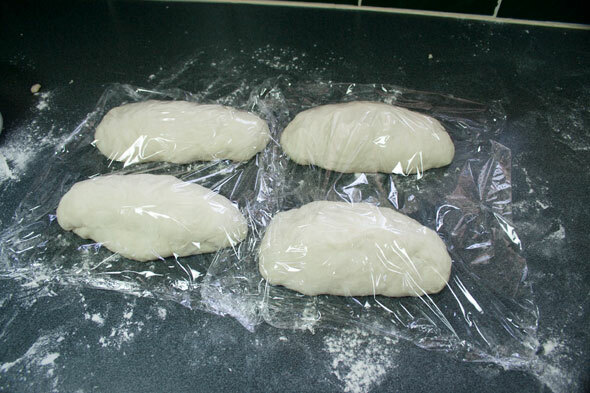 I then set to work dividing the remainder of the dough into four relatively equal parts, shaped them slightly and allowed them to rest for 15 minutes. 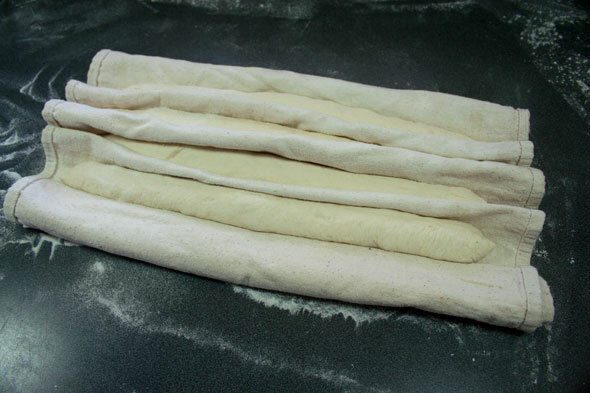 Following the video instructions on baguette shaping I posted on the French Bread page, I shaped these mini baguettes and set them to proof on the couche for, the book suggests, 1 to 1½ hours. Meanwhile, I fired up the oven with tiles to 460ºF. 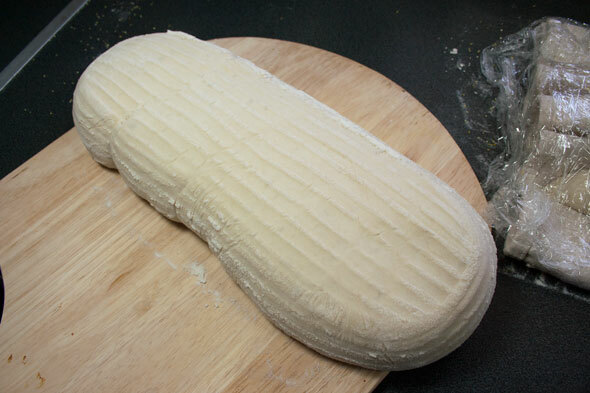 At the 45 minute mark, the loaf was already looking well over double sized. I was concerned it may have overproofed – it is 27ºC (80)F) in the kitchen today. Since the oven was already preheated, I decided it was time to get the dough in before the loaf collapsed. 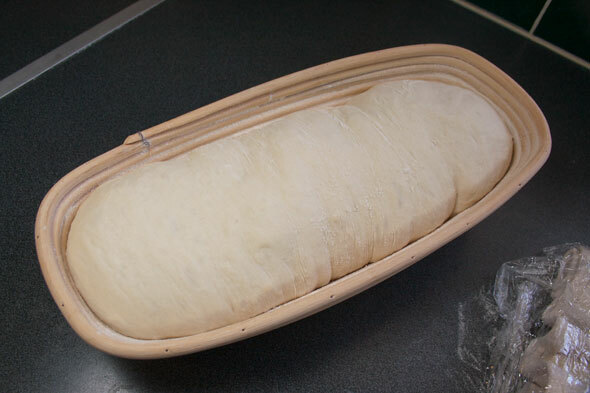 When I turned the basket out onto the peel, the very soft dough was spreading out a fair bit and threatened to droop off the sides. I slashed it very quickly – and it just as quickly spread even wider. Yep, overproofed, even if it wasn’t even close to the minimum 1 hour mark recommended by the book. Lesson here kids: let the DOUGH tell you when it’s ready, not the clock. The dough went into the oven along with a blast of steam, followed a minute or two later – since I wasn’t rushing for theses guys – with the slashed baguettes. The loaf should be getting 30 minutes while the baguettes should be ready in about 24. And here’s the lot of them. Look quite nice. probably could have left the baguettes in a little longer. The loaf rose slightly but it’s certainly not as oven springy as it should have been. Oh well. And lastly, the Crumb Shot. The texture is less “holey” than I had expected with a long pre-ferment but the flavour is decidedly a heap better than the faster french Bread from last month. Really nice, in fact. The crust, fresh from the oven (it doesn’t take long for these baguettes to cool) is a bit dense; iI expect it will “crunch up”as it dries out a bit. The crust layer isn’t very thick but it seems to carry a lot of the baked wheat flavour. So if it’s between this two-day baguette and the faster 4 hour one, this one wind easily. The actual “work” time is about the same so neither take more time than the other, you just give this one 10 minutes the day before. Absolutely worthwhile. 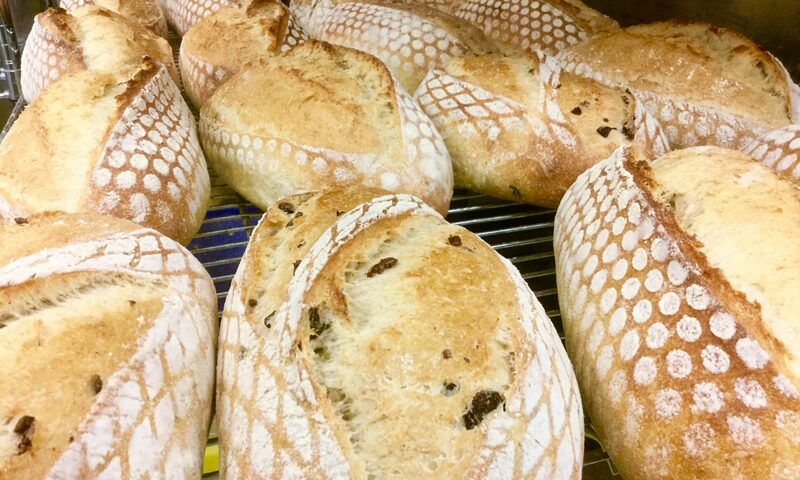 Do check out the other Mellow Bakers making this bread this month. This bread has also been YeastSpotted. So in spite of it’s drawbacks, the brad still had a decent, open crumb, perhaps even more so than the baguettes. We’re working on the back end of it at this point as well so it’s doing Toast Duty and I have no complaints – other than the shape. The taste is lovely, certainly better than the other “faster” French bread, by a fair margin too. So, although slightly mucked up (and totally due to Operator Error there), this is still a lovely bread, even after freezing. I urge you to give these a try, you’ll find the recipe on page 101 of Bread. I’m always so impressed with your slashing skills!!!! 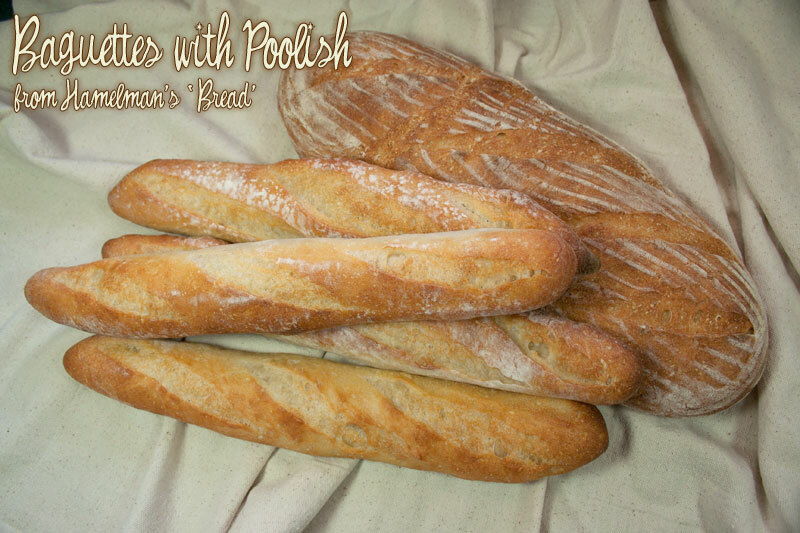 Scoring my baguettes last month was a disaster – hopefully it’ll work better this month. I have found that the bowl needs to be oiled. If you don’t, you’ll utterly tear the dough as you transfer it out of the bowl and onto the bench as it will stick to the sides of the bowl and rip apart. This can damage the gluten structure you’re trying to develop, rather counterproductive. 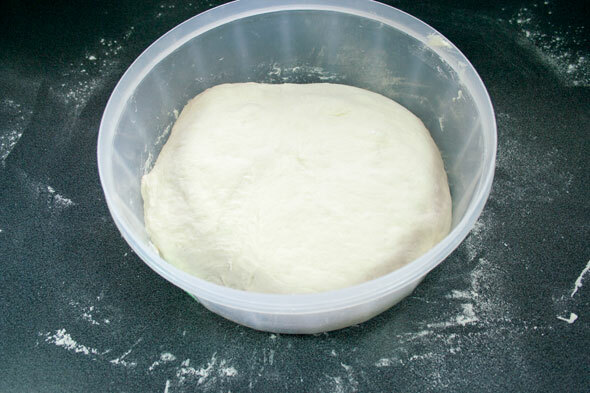 There’s also a difference between adding oil to the dough and letting the dough sit in a container that has been oiled. There’s less than a quarter teaspoon of oil smeared around the bowl, the bulk of which remains on your hand, pastry brush or bit of paper towel. 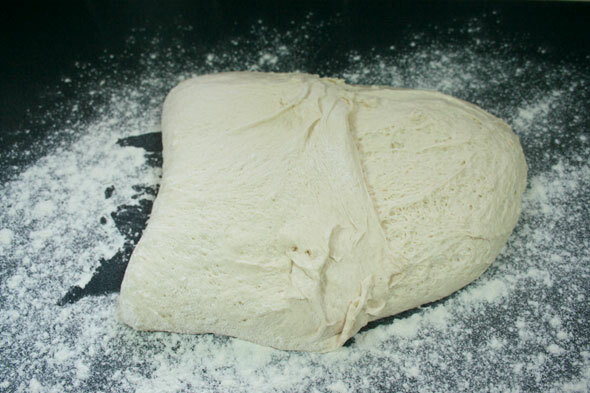 What oil transfers from the bowl’s sides to the dough is miniscule. 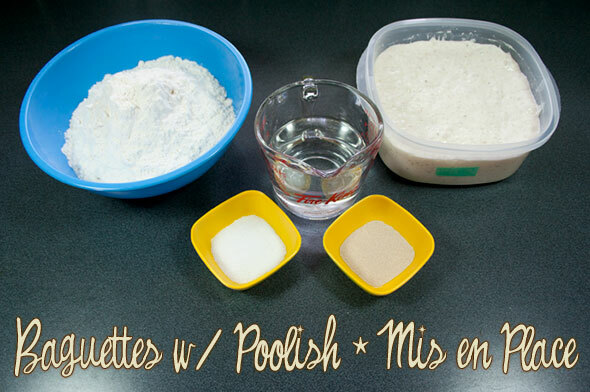 Adding oil to the dough, yes, would make it an “enriched” dough and would likely change the bread’s structure in subtle to obvious ways. 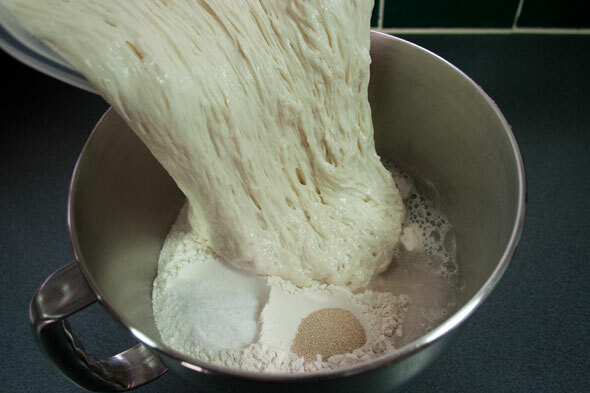 When I’m beating with a dough hook, it is always firm enough to just cling to the hook and follow it around in one mass. Is this caused by too much flour? 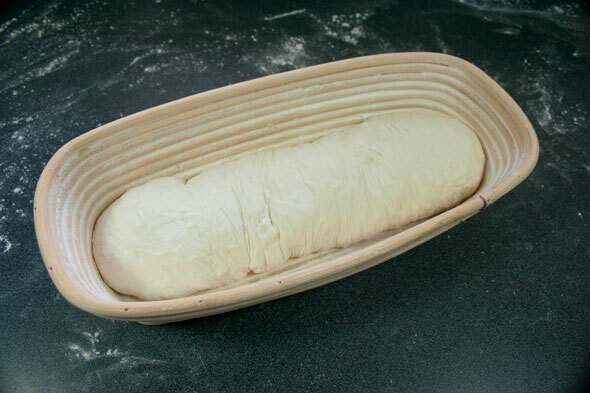 Hitching on the dough hook for a ride is possibly due to too stiff a dough and/or not enough volume of dough to rub against the side of the bowl. 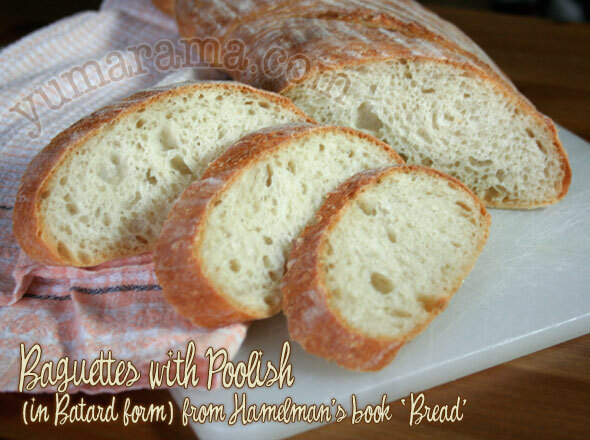 Are you cutting the recipe down in size because you don’t want/need that much bread? If so, you may simply have to knead the dough by hand for a few minutes if the dough hook isn’t doing what you want it to. The flavour difference was that there was some with this one, the French Bread version was pretty weak flavoured. Seemed all the flavour was in the toasted crust; the crumb didn’t really offer anything much save for texture (comparatively – it was still better than Wonder bread). Here I found the crumb carried itself well, had developed a little nutty wheat flavour of it’s own. One might even call it “subtle complexities”. Did you and your (other) test subjects not find the quick version a little less interesting, even just in comparison? Were they being “nice”? Thanks for the response Paul! Very nice post, clear and easy to read. In what way did you find that the flavor differed between the ‘plain’ baguette and this one? Thanks for sharing, Paul – sure wish I could score that dough as well as you do! Next PostNext Rye with Caraway: Learning when to say when.